A family moves to the country to run a rustic mountain inn when, to their horror, the customers begin befalling sudden and unlikely fates. 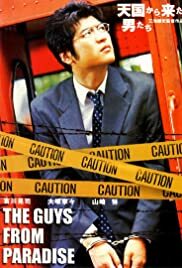 A group of Chinese youths living in Japan struggle to make their way in life and eventually find trouble with the local crime syndicate. In order to settle a business dispute, a mob leader murders one of his own teenage sons. The surviving son vows to avenge his brother's death, and organizes his own gang of teenage killers to destroy his father's organization. A troubled and perverted family find their lives intruded by a mysterious stranger who seems to help find a balance in their disturbing natures. Amidst a Chinese and Japanese mafia war, a lawyer for the Chinese mob finds a rift forming between him and his corrupt police office brother. A fearless Yakuza captain's loyalty is tested as two ambitious underbosses attempt a takeover of both his clan and a rival Yakuza gang. Two contract killers cross paths in the middle of the same job and realize they are childhood friends. Violent gangster movie with a Brazilian protagonist.